When 140, 000 Jews left Iraq, whatever happened to the property they left behind? This report on the Hona Baghdad Channel (Arabic) has been stirring Jewish memories on social media. It begins with a visit to the home of Sasson Heskel, modern Iraq's first Finance Minister, now an arts centre. The programme's presenter then takes us to see the Watania primary school which was located near Qunbar-Ali. The principal was the Arabist Ezra Hadad. After a visit to Sook Hanoon, we are taken to the imposing entrances of Jewish homes in Abu Nawas St in Bataween, a new district of Baghdad built along the Tigris in the 1930s. Emile Cohen in London makes periodic appearances on Skype. He describes how the last desperate Jews of Iraq escaped from their homes leaving the television switched on, so that no one would suspect they would be gone for good. Most of the houses had been sequestrated by the government. There was no chance of the Jews getting restitution - the Jews were considered 'the enemy'. The overall impression is of neglected sites badly in need of repair, with graffiti on the walls and rubbish strewn all around. Few Jews would recognise their homes, schools and markets in Baghdad today. 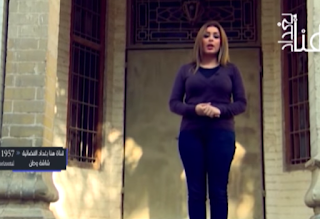 PS The video ends with a view of Baghdad's new Jewish cemetery, with its 2, 000 graves. The land was donated by the Daniel family after the government destroyed the original Baghdad cemetery in 1958. Is it possible to watch this with English subtitles? If it were possible I would have posted it with English subtitles, Charlie!